A pastrami and rye sandwich just wouldn’t be the same without caraway plant seeds. It’s the caraway that sets rye bread apart from all other deli breads, but did you ever wonder how else to use caraway seeds? There are a plethora of caraway uses, primarily for use in cooking but also to cure medical woes. Read on if you’re interested in what to do with caraway post harvest. Caraway (Carum carvi) is a hardy, biennial herb native to Europe and Western Asia. It is primarily grown for its fruit, or seeds, but both the roots and leaves are edible. Caraway is a member of the umbelliferous, aromatic plants along with anise, cumin, dill, and fennel. Like these spices, caraway is naturally sweet with a licorice flavor. The first season of growth, caraway plants form a rosette of leaves that look rather like carrots with a long taproot. They grow to around 8 inches (20 cm.) in height. In the second season of growth, 2- to 3-foot tall stalks are topped by flat umbels of white or pink flowers from May to August. The following seeds are small, brown and shaped like a crescent moon. 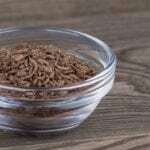 If your experience with caraway seeds extends only as far as the aforementioned pastrami and rye, then you might be wondering what to do with caraway plant seeds. The roots are similar to parsnips and, just like this root veggie, are delicious when roasted and eaten alongside meat dishes or added into soups or stews. The leaves of caraway herb plants can be harvested throughout the summer and added into salads or dried for future addition into soups and stews. The seeds, however, can be found in many different cultures in pastries and confections and even in liqueurs. How to use caraway seeds from the garden? Incorporate them into poaching liquid for fish, pork roasts, tomato-based soups or sauces, warm German potato salad, or into coleslaw or cabbage lovers’ favorite dish – sauerkraut. Essential oils pressed from the seeds have been used in many cosmetics such as soaps, lotions, creams and perfumes. It has even found its way into herbal toothpastes. In times past, caraway was used to soothe a number of physical ailments. At one time, it was even believed that caraway herb plants could act as a talisman to protect people from witches and was also added to love potions. More recently, caraway was added to the food of tame pigeons, with the belief that they would not stray if fed this delicious herb of many uses.